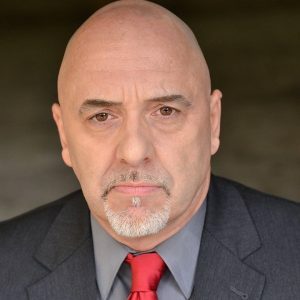 He played in Chris Ethridge‘s Dollar Baby Survivor Type as Antonio Pinzetti. David Calhoun: My name is David Calhoun and I am an actor and voice-over artist born and raised in the Atlanta area. I’ve been married right at 27 years and have a son who recently turned 25 years old. David Calhoun: I think that I really knew that I wanted to be an actor after I received a favorable response/reaction when I was in the spring musical in my senior year in high school. But I have to thank my girlfriend at the time for getting me to audition for the play (“Brigadoon“). She actually dared me to audition and I did and ended up getting one of the male leads. Once the acting bug bit, I was hooked. I didn’t get to return to the stage until years later after my military service. SKSM: How did you become involved in Survivor type Dollar Baby film? David Calhoun: I became involved in “Survivor Type” when my agent asked me if I wanted to audition for an independent film. She said that it wouldn’t pay much, but it might end up as good footage for acting “reel”. David Calhoun: Yep. I auditioned for the role. SKSM: You worked with Chris Ethridge on this film, how was that? David Calhoun: Working with Chris was interesting because Chris had a vision of what he wanted to film and he wanted to stay as true as possible to Mr. King’s work. AND– he had to do it on a shoestring budget. He has a great sense of humor that really helped because I remember during that shoot it was oppressively hot in Georgia. Humor definitely helps. David Calhoun: Nah. Not really. David Calhoun: I still hear from William Harrison, who played Richard as a boy). Last I heard, he’s off at college and making a name for himself. I also hear from Kelly Natividade, who now lives out in California and got married a couple of years ago. David Calhoun: I just finished an episode of “Murder Calls” for the Investigation Discovery Channel that should air sometime in March or April. Hoping that 2018 takes off and is better than 2017. David Calhoun: There are some elements of Stephen King’s work that I DO like and some that I do not. I can’t say that I “follow” his work or that I’m really a fan. His constant use of flashbacks and the way that the story is told, is sometimes hard to follow. I think that is why his written work is hard to translate onto the big or small screen. David Calhoun: Something that most people would be surprised to know about me is that I was injured in a work-related accident that shattered my spine in two places and left doctors telling me that I would never walk again. And yet here I am years later and I am attempting to run a marathon in all 50 states and only have 16 states (plus Washington DC), remaining. Also, despite the fact that I tend to always play some rough-talking or hard-nosed character… I’m actually a Teddy bear. David Calhoun: Support your independent film-makers. Whether it be by helping finance a film or attending independent film screenings. These creative minds need to be seen and heard. David Calhoun: Thanks for the questions. Feel free to go to: www.imdb.me/davidcalhounVI and check out my work. And if there are any independent film-makers out there who have a movie that you think that I might be a good fit in, let me know. It’s all about the process and a process that I am honored to be a part of.